The Model 973 High Intensity Pressure Transducer is designed for the measurement of dynamic pressure events, such as explosive blasts and highlevel pressure pulses in the frequency range of 2 Hz to 18KHz. This unit is designed for use in the most corrosive environments. The unit is housed in a rugged stainless steel housing and incorporates a hastelloy diaphragm. 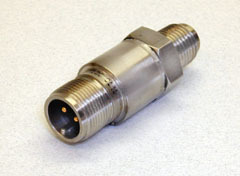 The stainless steel MIL-style connector combined with the all-welded construction provides a true hermetic seal. The sensor's integral electronic buffer provides a low impedance output when used with constant current sources of 2 to 10mADC. Consult the factory for customized versions of this sensor.